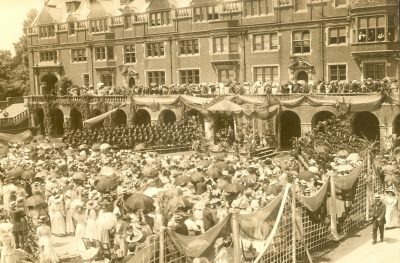 Ever since the University moved to West Philadelphia in 1872, Penn students and alumni have been bound together by the continuous observance of a number of student customs and traditions. Today the most notable is the annual Hey Day event which incorporates elements of many other traditions past and present. The oldest traditions are Class Day, the award of Senior Honors, and the Bowl Fight, which are first documented in the collections of the University Archives in the year 1865. At that time Penn was still located on Ninth Street, between Market and Chestnut Streets. In 1865 the senior class decided to supplement the stiff and formal Commencement ceremonies with a day set aside for youthful celebration. In that year, the first Friday in June was declared “Class Day”. The seniors held a class meeting and dinner, off-campus, during which they spoofed the faculty and administration, denigrated the lower classes and recognized one another with mock and serious awards. This is when the Spoon was introduced as the symbol of the most popular man in the class. While the graduating students frolicked on Class Day, they took a more sentimental view on Ivy Day. 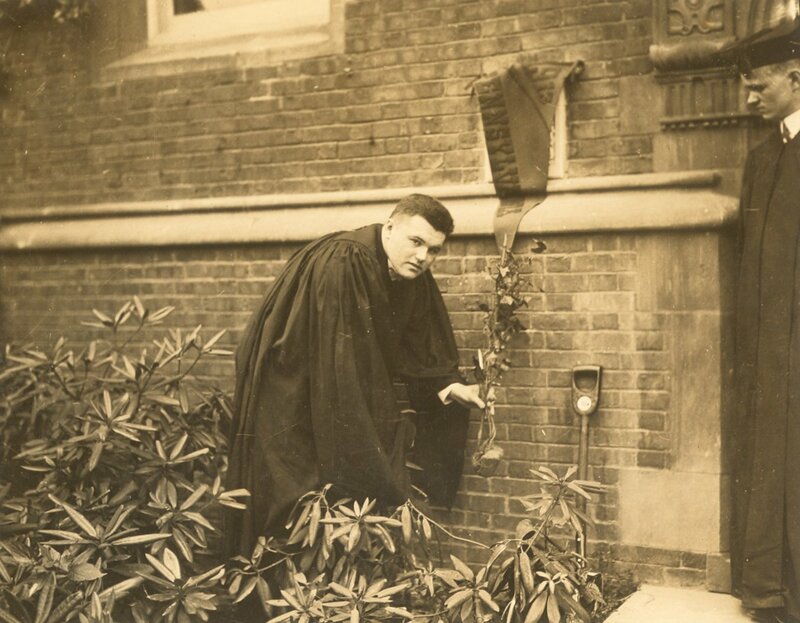 In 1873, the first graduating class on the West Philadelphia campus established Ivy Day as a new tradition set aside for the senior class. On the first Ivy Day, a twig of ivy was imported from Kenilworth Castle in Scotland, to be planted on the facade of College Hall. As the vine was planted, an invocation was pronounced, “Having been nurtured this far in its development, it is now able to take roots for itself and grow greater and greater through the years”. Thus, ivy became a lasting symbol for each year’s graduating class. This tradition soon became elaborate and an Ivy Ball accompanied the planting of the ivy. In 1916, Hey Day was established as a “Moving-Up” celebration, modelled after a similar custom recently established at Syracuse University. Its purpose was formal: to mark the advancement of each class. In 1931, Class Day and Hey Day were officially combined into a single celebration, with Ivy Day also being moved to the same date. At the time, the celebration consisted of a traditional ceremony in Irvine Auditorium, followed by the planting of the ivy. Hey Day included the reading of the Class History, Class Prophecy and Class Poem, the presentation of the four Senior Honors Awards and the announcement of those elected into various honorary societies. Through the years, the emphasis of Hey Day shifted from the formal assemblies to student celebration, marked by the introduction of the Parade of Classes in 1937 and the incorporation of the Junior Cane March in 1965. In recent decades Hey Day represents the official passage of the junior class to senior status and is characterized by thousands of marching students parading around campus sporting fake straw hats, red T-shirts and canes. In 1916, the University decided to inaugurate a new day in its history, temporarily called “Moving-Up Day” for the lack of a better title. On this day, the Juniors were to be made Seniors, the Sophomores Juniors and the Freshmen allowed to assume the dignity of Sophomores. The idea of celebrating a “moving-up” day at Penn was instigated by a similar custom that had been successfully established at Syracuse University a few years earlier. However, to make the event “strikingly characteristic of Pennsylvania”, a sub-committee was appointed to come up with a proper name for the celebration. In May of 1916, the name “Hey Day”, a day of rejoicing, was definitely selected as a proper title for the event. More than anything else, Hey Day served as a means of consolidating a number of traditional events that had been scattered throughout the second term. 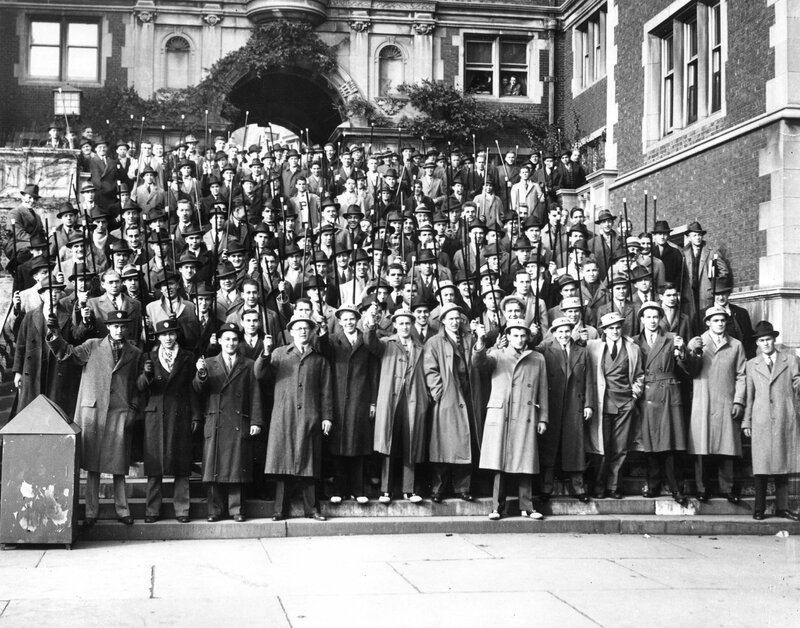 As in later years, the main feature of the 1916 Hey Day was a giant convocation of all undergraduates, which the seniors attended dressed in their caps and gowns. After these exercises were held, Provost Smith gave a short talk, the retiring president of the Senior Class introduced the new leader, and the results of various society and cheerleader elections were read. Although the Hey Day ceremony was an important part of the celebration, it only marked the beginning of the day’s events. The evening of the 1916 Hey Day included a variety of activities meant to appeal to the student body, largely consisting of various competitions between the classes. 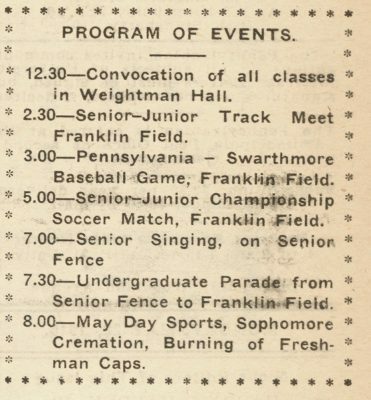 Among the athletic events of the day were the Senior-Junior Track Meet, the Penn-Swarthmore Baseball Game and the Senior-Junior Championship Soccer Match, all held at Franklin Field. At 7 o’clock, the seniors commenced their annual senior sing by the Senior Fence, located at the back of College Hall. Meeting in a large parade, the undergraduates then conducted the seniors to Franklin Field, where the events of the evening commenced. 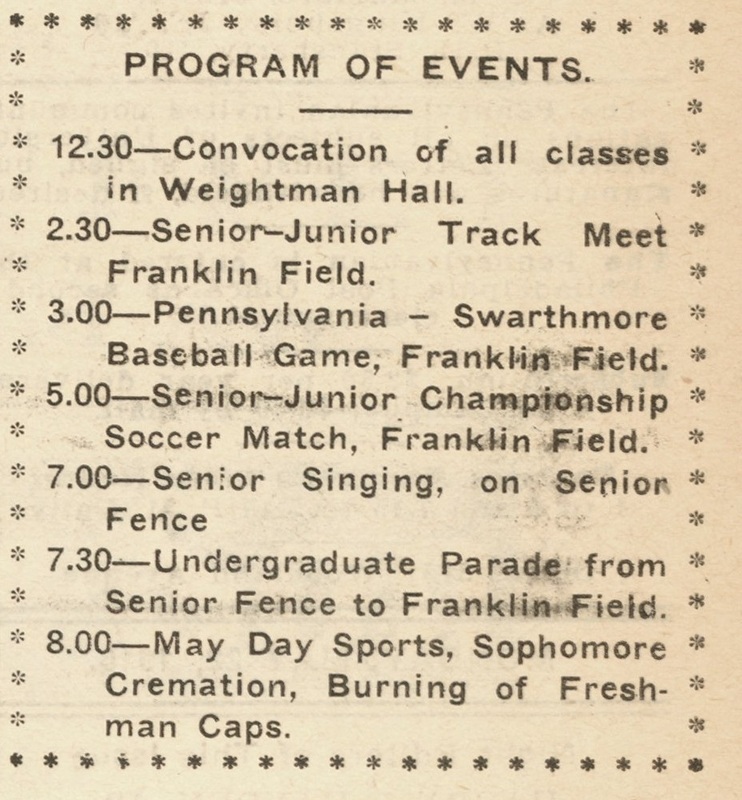 These included sports such as wrestling and boxing, an annual tug-of-war event between the freshman and sophomore classes, and the Sophomore Cremation. As a fitting conclusion of the day, a great bonfire was raised over the glowing coals of the faculty members’ smoldering remains, into which the jubilant freshmen threw their hated black caps, celebrating their newly attained sophomore status.